The period between WWI and World War II (WWII) was a time of increased discovery about underwater acoustics. Scientists were beginning to understand some fundamental concepts about sound propagation, and underwater sound was being used to explore the ocean and its inhabitants. For example, shortly after WWI, H. Lichte, a German scientist, developed a theory on the bending, or refraction, of sound waves in sea water. Building on work by Lord Rayleigh and an earlier Dutch astronomer named Willebrord Snell, Lichte theorized in 1919 that, just as light is refracted when it passes from one medium to another, sound waves would be refracted when they encountered slight changes in temperature, salinity, and pressure. He also suggested that ocean currents and changes in seasons would affect how sound travels in water. Echosounders became commercially available following WWI. Echosounders were invaluable for the task of helping ships avoid running aground in shallow water. In the deep sea, they revolutionized our knowledge of seafloor structure. Perhaps the first practical application was the use of an echosounder to select the best route for an underwater telegraph cable between Marseilles, France, and Philippeville, Algeria, in 1922. 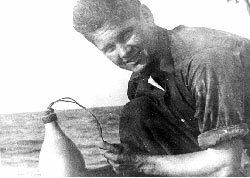 Joe Worzel, bomb in hand, in an experiment to measure the sediments and rock of the seafloor in about 1939 (Hersey, 1977). Image courtesy of Woods Hole Oceanographic Institution. During this period, scientists also discovered that low frequency sound could penetrate into the seafloor. They found that the sound would be reflected differently from individual layers in the sediment. For the first time, using sound, scientists could create a picture of what was beneath the seafloor. This provided clues to the history of the earth and a means for prospecting for oil and gas beneath the seafloor. Pioneering work was done by Maurice Ewing at Lehigh University, later at Columbia University, and Allyn Vine, Bracket Hersey, and Sidney (“Bud”) Knott at the Woods Hole Oceanographic Institution (WHOI). 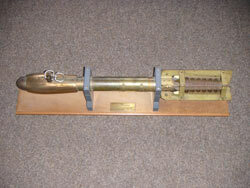 In 1934, Ewing, Vine, and Joe Worzel, who was a student of Ewing’s, produced one of the earliest seismic recorders designed to receive sound signals on the seafloor. The need to generate high-energy, low-frequency sound that could penetrate deep into the seafloor led to the use of explosives and eventually to the development of air-guns and high-voltage discharges (sparkers). Fisheries acoustics also began during this period. The possibility of detecting echoes from sardine and herring schools was suggested in 1924 by P. Portier in France. A few years later, the French navigator Raymond Rallier du Baty attributed abnormal signals on his echosounder to a school of cod on the Grand Banks. The first successful experiment demonstrating the acoustic detection of fish was published in 1929 by K. Kimura, in Japan. Shortly after the end of WWI, scientists from Great Britain argued that submarines could be quieted to such a degree that passively listening for their sounds would not be effective. The navies of Great Britain and the United States therefore focused on developing echo ranging systems to detect submarines and measure the range and direction to them. Just prior to the outbreak of WWII, U.S. Naval ships were equipped with echosounders for measuring depth and improved echo ranging systems that could detect a submarine up to several thousand yards away. The echo ranging systems proved mysteriously unreliable, however. During an experiment in 1937, the performance of the echo ranging systems consistently deteriorated in the afternoon, sometimes failing to return echoes at all. The scientists had a new instrument called a bathythermograph, or BT, that held a temperature sensor and an element to detect changes in water pressure (a proxy for water depth). It recorded temperature vs. pressure (depth) on a smoked glass slide as it was lowered through the water from a ship. In the warm upper layer of the ocean, sound is refracted toward the surface. 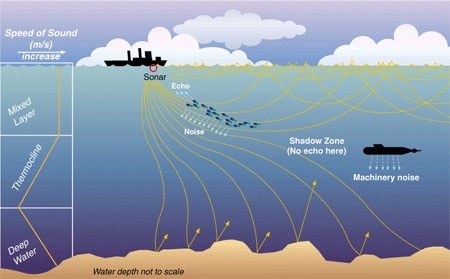 As sound waves travel deeper into colder water, they slow down and are refracted towards the seafloor, creating a shadow zone in which a submarine can hide. Image courtesy of the National Academy of Sciences. This direct connection between oceanographic conditions and the propagation of underwater sound was essentially a rediscovery of Lichte’s earlier results. It became clear that scientists needed to know how sound speed changed with water depth in order to predict sonar performance. During WWII, the BT became standard equipment on all U.S. Navy submarines and ships involved in antisubmarine warfare.